We are pleased to announce that Richmond Chambers has become the first barrister-only chambers in the UK to gain an Alternative Business Structure (ABS) licence. This news has already been featured widely in The Law Society Gazette, Legal Futures and Solicitors Journal. Under the licence, The Solicitors Regulation Authority (SRA) will regulate our chambers as an entity, while individual barristers within will continue to be bound by the barrister&apos;s code of conduct. Based in Covent Garden, London, Richmond Chambers specialises in all aspects of UK immigration law. Established by Paul Richmond , we currently have two other barristers – including Sarah Giddens, the ABS’s head of legal practice – and three paralegals. Our three barristers have nearly thirty years of experience between them practising at the independent bar. The ABS licence will be used by Richmond Chambers to attract both clients and aspiring members of the immigration bar who are interested in a different business model to the traditional barristers’ chambers. Chambers will also become an LLP on 5th July. The new status of Richmond Chambers assures members of the bar, including new entrants to the profession, the independence and flexibility that they have traditionally enjoyed, combined with the collaborative working, career growth and job security found in a progressive law firm. The new ABS status has also enabled us to introduce a team of managing partners, who are able to provide a strategic decision-making capacity and direction that would not otherwise be present. Additionally, being an ABS has allowed us to bring a non-lawyer with financial management experience to our management team. The legal market is in a state of flux, yet this ensures ‘the financial stability of Chambers in its early years, as well as its successful growth and development in the longer term’, says Mr Richmond. 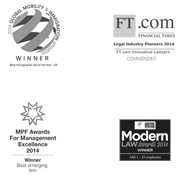 To get in touch with our immigration barristers, please contact us here.